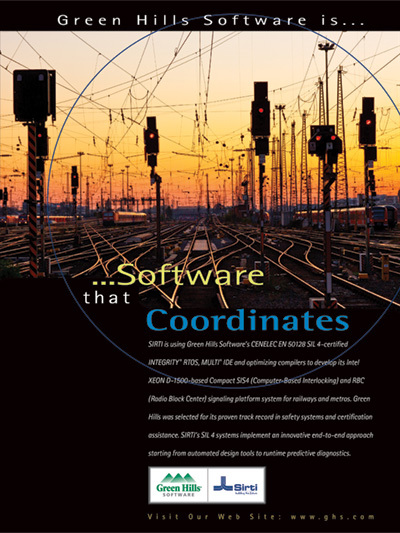 SIRTI is using Green Hills Software's CENELEC EN 50128 SIL 4-certified INTEGRITY RTOS, MULTI IDE and optimizing compilers to develop its Intel XEON D-1500-based Compact SIS4 (Computer-Based Interlocking) and RBC (Radio Block Center) signaling platform system for railways and metros. Green Hills was selected for its proven track record in safety systems and certification assistance. SIRTI's SIL 4 systems implement an innovative end-to-end approach starting from automated design tools to runtime predictive diagnostics.